You’ve had this happen. Someone finds out you have a horse and they ask, “Do you know my sister’s friend, Diane. She has a horse.” Like there are eleven of us in the state. People who own horses are a wide and diverse group. We divide ourselves by breed and riding discipline. Some of us crave the comradery of competition and some of us “only trail ride.” And we have strong opinions about it, not that it matters. Some of us are big talkers and small doers. Some of us just work with rescues. We started with horses when we were so young that we can’t remember a time we weren’t horse-crazy girls. Some of us set ourselves free at 45 or 50 with a mid-life first horse. Some of us have good hands and some of us just think we do. Some of us know everything and some of us hope to be taking lessons forever. Some of us fight with horses because we think it’s the only way. Some of us give up riding because our horses are so unresponsive to us. I know it’s crazy but in the world of people who own horses, not everyone cares about horses all that much. You can tell by their words and actions. There are numbers of professional trainers don’t even particularly like horses, much less respect them. And some of us don’t tell the truth as a matter of habit. Do you know the difference between people who own horses and a horseperson? The thing to notice immediately about that moniker is the word horse comes first, and not by random coincidence. Horsepeople are a sub-species of horses, not humans. At some point, they changed teams and being human became less important. It’s a disease, a mental affliction that infects the entire body, from our fixated brains to our manure-coated boots. The pre-teen years are the worst, we can’t sleep and spend a lot of time cantering and trotting around the house. A few horse-crazy girls grow into horsepeople and become insufferable. Like micro-managing drug addicts, we obsess about hoof angle or saddle fit. We go on about bits and supplements and what our horses do in turnout. My Dude Rancher, who tires of horse conversation after an hour or so, will tell you we are only fit company for other horsepeople. He’s right. Some of our rides are euphoric, but many are just fundamental communication. Trying to understand and asking the same in return. We have big dreams and low expectations, happy for every good stride. Nothing is more important than the health and soundness of our equine partner. We treat our elders with respect. The old campaigners that taught us how to ride, the kind boss mare that gave birth to champions, the sweet gelding who takes care of kids: It isn’t that we treat them like family members. They are family members. We adjust our lives to suit our horses and make each of our life decisions with them a priority. People who are blessed with horses and money make it look easy. It’s a bit trickier without a trust fund, but we find a way. We change careers, we give up vacations. We do without less important things and don’t whine about it. After all, they are less important things. Because we are just like our horses, we tend to be a physically tough bunch, not afraid of work or dirt or poop. But on the inside, we belong to the herd. We’re mush, sweetness, and a weathered hand on a patch of hair. We protect our horse-crazy hearts by being tough, and the mushier we are on the inside, the more defensive of the horse on the outside. We always save our best for horses. At the end of the day, hands crack, feet ache, and there is that honest exhaustion that comes from work well done. We slump on the sofa with a couple of dogs and cats and that old movie comes on the TV. We’ve seen it a hundred times. It’s one from the genre labeled Horse-Crazy Girl Movies, like Black Beauty or The Man from Snowy River or Seabiscuit. We hunker down and when the scenes come where the horses gallop in slow motion, for the hundredth time, we tear up. We will never stop any of it. Horses are in our blood. We put them in front of our own needs. How to get on the bad side of a horsewoman? Easy question, be cruel to any animal, but especially a horse. Acting from a place of personal convenience over animal welfare will not to be tolerated, any more than parents who put their desires above their children’s needs. But even horsepeople know we can’t save them all. Of course we still try. We must try. A week ago, a good dog lead the way to the discovery of 14 horses dead on the ground and another 10 living among the remains close by in Black Forest. The woman who followed her dog into the barn called the sheriff and the press. Smart. I am not going to rehash the gory details one more time. You don’t have to be a horseperson to recognize this level of brutal neglect. There was so much wrong, fundamentally wrong, before lye was dumped on carcasses and covered by tarps. It started so much smaller than that. And sadly, too many horsepeople who live in this county have struggled with the sheriff’s office in an effort to get our weak animal welfare laws enforced. Horse rescues don’t fare much better than individuals. Here is the good news: this is one time when complaining helps. Horsepeople stood up for what was left of this herd, all over the world. We loudly signed petitions; thousands of us called and emailed county officials. I am so proud. Press from the sheriff’s department defensively defend their actions but at the same time it’s obvious that given the chance, this incident would have been swept under the rug like so many others. We didn’t let them. We came out of our home barns and spoke up in such huge numbers that things changed. The surviving horses got help. It was a small victory in the big picture but with our foot in the door, it is also no time to back off. Horsepeople need to push ahead with stronger animal welfare laws and enforcement. We can’t stop here. My point is not rant about who loves horses the most. We are a pretty judgmental group and I don’t want to pour gasoline on that fire. What I am hoping is that in the shadow of this horrific incident more people who own horses will cross the line and become horsepeople. In your heart, you know where you stand. Are you holding back? Is there more you can give? If you are a horseperson, now is the time to put the muck fork down and speak up. Maybe the biggest fact a horseperson accepts is that no matter how great the commitment we have, no matter how much time and money and sweat we happily offer our own horses and horses out in the world, we will always be asked to give more. And then, one more time, we will have to dig deep from the infinite well of passion and purpose horses have given us, and find a way to do even more -graciously and generously. We learned that from horses, too. Thanks, I couldn’t have done it without a corgi under foot desk. Spring Hill Ranch in Vermont is struggling with the State over this issue. They have rescued so very many horses lately, the most egregious case was three Arabs taken from imprisonment in a dark barn for 20 years, standing on the carcasses of their stable mates, with feet – ugh, I shudder to remember the photos. The State has refused to prosecute, but laws are in the works now. Awk, push on with the laws. Push hard. Heard. We just rescued four starving polo ponies across the street. Thank you Anna for speaking our hearts and call to action I shared with the ladies at the rescue. Thanks for all that you do at your rescue! Went on a rescue pick up with my friend Melanie Bowles of Proud Spirit Horse Sanctuary. The trip was over three hours each way, and she had been trying for over a month to get the owners to relinquish these two horses. I’ll spare you the details. She renames all her rescues: One she called Sparrow, the other Lark. Sparrow was so weak; he didn’t make it. Lark thrived under Mel’s care. Arkansas was not a horse-friendly state; Mel battled for every horse she saved and cried for the ones she couldn’t. Here in Florida things are a little better; our local Animal Control listens. But you have to be persistent, and you have to be noisy. You probably will make some people really mad at you…but that’s what horsepeople do for horses. Thanks Mel for being an angel here on earth. Thanks Anna for reminding me how damn proud I am to be a horseperson. Proud Spirit Horse Sanctuary and Melanie make us all proud. Your heart shows in your writing. Just beautiful. Thank you. 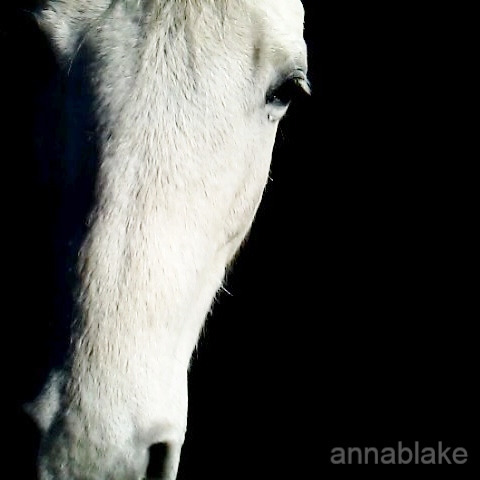 Thank you, and I think you know this, but our hearts are tiny compared to theirs…I learned that from horses too. Obviously, the people in the Black Forest were “horse hoarders” but it is interesting that no one knew about it sooner or wanted to get involved? Does it rake a dog to do a man’s job? Sometimes dogs trespass where humans legally fear to go… and I work with a rescue. It isn’t as easy as it should be to help horses who belong to others, especially those hidden behind fences, trees and barn walls. We have to do better, no doubt about that.